Hi everyone! 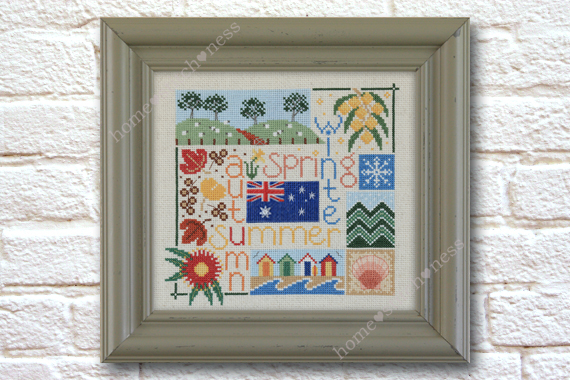 Just popping in to announce a new pattern release - 'Four Seasons in Australia' by home♥stitch♥ness. If you have been following me on Instagram or Facebook, you may have noticed that my recent stitching project looked familiar. Two years ago I released 'Four Seasons in New Zealand' and it quickly became a popular design. For quite a while now, I've had the idea of designing an Australian version since there are so many similarities between our two countries and I am pleased to say that it is now done! For comparison, I'll post a photo of 'Four Seasons in New Zealand' below. As you can see, there are a number of similarities between the designs. Most of the colours are the same and it was easy to turn a few New Zealand icons into Australian ones - for example I switched the kowhai flowers with wattle and the pohutukawa flower with a red flowering gum blossom. The sheep farm is very similar, but instead of poplars I added a few gum trees on the horizon and a red earth lane leading up through the farmland. The autumn panel has lots of gum nuts scattered about and my favourite of all the miniature scenes is the beach with the 'beach boxes' - inspired by the bright and colourful Mornington Peninsula beach boxes that my relatives took me to visit when I was a teenager - they are so cool! These patterns are really FUN to stitch! There are so many little pictures that make up the design that it is easy to stitch one scene at a time and see a lot of progress in a short time! Celebrate the changing seasons in our countries by stitching one of these designs! 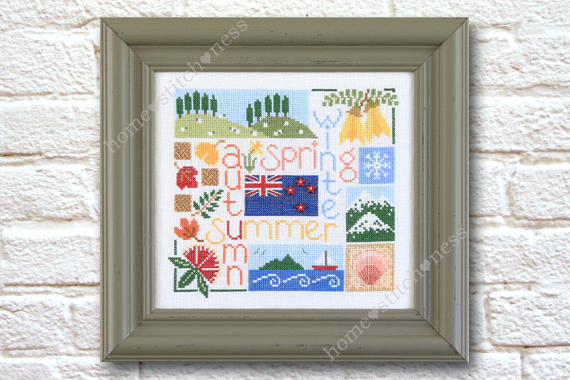 The 'Four Seasons in Australia' instant download/PDF pattern is available in the home♥stitch♥ness Etsy shop for a special introductory price of NZD $7.00 (approximately AUD $6.60) until the end of March. I have also put 'Four Seaons in New Zealand' on sale for a limited time as well - for just NZ $12.00 you can receive your hard copy pattern (which includes 4 x red star buttons to be sewn onto the NZ flag) in the mail and postage is free anywhere in the world!